Dr. Isaura de la Caridad Gonzalez Clinical Psychologist, Educator, Founder of Latina Mastermind & National Society of latina Leadershipa & Empowerment as a Clinical Psychologist and Educator. 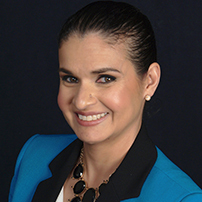 Dr. Isaura de la Caridad Gonzalez has utilized her expertise and trailblazing skills to support others, specifically the Latina population, to expand their businesses and create top sum financial legacies. She is a multilingual innovator who founded one of the top Psychology practices in Staten Island as well as multiple other organizations, which aim to empower and inspire Latina entrepreneurs to learn the skills that will bring their businesses to the highest level. in business globally, by the same names as the organization, Latina Mastermind, where not only can businesses can be found throughout the world but it includes real-time live networking capabilities. Dra. Isaura, also, created the first and only podcast on Latina Leadership in the world to gap the need for Latinas in creating their professional, personal and financial legacies. She is currently establishing the first and only network on Social media for Latina Podcasters to teach other Latinas how to amplify their voices and leverage their thought leadership to the next level where Latinas can not only surpass the glass ceiling but create a new realm of leadership. As an expert in Women’s Leadership Development, Dra. Isaura understands how to help Latina entrepreneurs accelerate their businesses and leverage their expertise. She has a passion for spearheading ways to bring about value within a business, as well as educating others to create their own value and professional success. She put her face in the media by being a Linkedin author, a SheSource Media Expert, guest blogger for Sharon Lechter, speaking on National Public Radio (NPR), keynoting all around the US and internationally and countless other media outlets raising awareness for Latinas, about Latinas, Latina Leadership and the impressive power Latinas hold as a collective. She understands that powerful Latinas know that shattering the perceived glass ceiling takes a family to achieve it and she welcomes them to her family where the focus in on celebrating Latinas success stories. Currently, Dr. Isaura Gonzalez is continuing her passion for education as a lecturer at the graduate level, while also using her expertise to raise awareness through the media so that Latina Mastermind can make a difference in a Latina entrepreneur’s life. Her passion is driven by her 4 children for whom her heart beats for.